We went to Edinburgh twice, once a quick in-and-out to catch the Scottish Ballet, and once at Christmas to explore this city more fully and, wonderfully, to share it at New Year’s with the kids, who came to visit. So this is Edinburgh in two parts; Part I will include all our first visit and a bit of the second. Edinburgh has been the capital of Scotland since the 1400’s. With a commanding 10th century castle, it was a medieval powerhouse in its time. 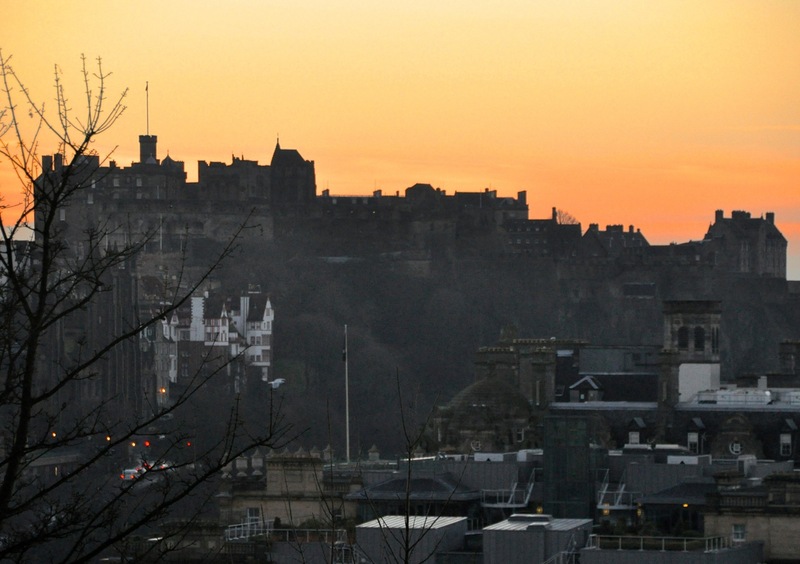 It was once the most crowded city in Europe; with rich and poor living on top of each other, it was famed for its medieval skyscrapers – and for its filth and stench (its nickname was “Auld Reekie”). In the 1700’s it expanded into “New Town”, an area of magnificent Georgian buildings where the upper crust could separate themselves from the rabble. The Old and New Towns are both listed as World Heritage Sites. Today Edinburgh is the home of the Scottish Parliament and is the second most popular tourist destination in the UK after London. Castle to the Palace of Holyroodhouse). The Royal Mile in particular is lined with historic buildings, including St. Giles’ Cathedral, Scotland’s most important church. That impressive crown steeple is from 1495; the exterior is Neo-Gothic from the 1800’s. We didn’t go inside this time – but just wait, we’ll visit it later! 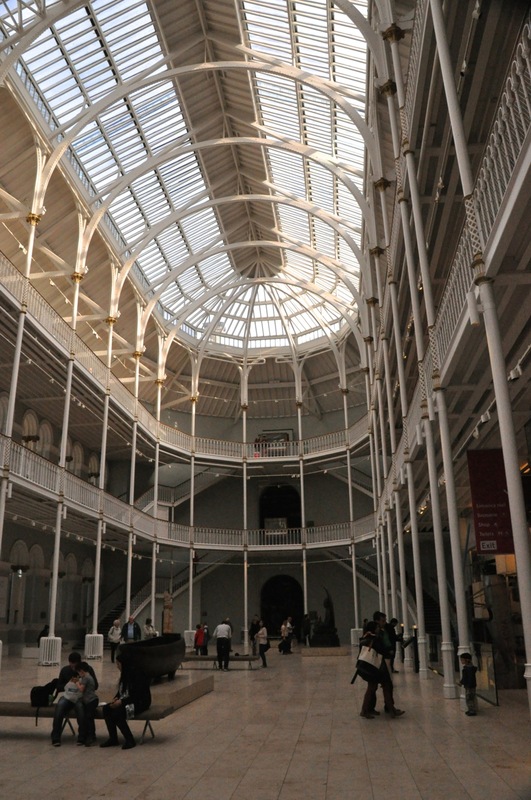 What we did take in was the National Museum of Scotland (interior shown on the left), which had some really cool stuff. Its primary focus is Scottish arts and history, but there are amazing things from other places, such as those shown below. On the left is a relief from Assyria – gorgeous, isn’t it? It’s from the late 800’s BC, from the palace of King Ashurnasirpal II, showing the King as a bearded high priest facing a court official and listing some of his military victories. It was excavated in 1840 and owned by a Scottish obstetrician. On the right is a fabulous Chinese vessel depicting a battle scene – alas, I don’t know it’s age. OK, back to Scotland’s history. At the beginning of the first century AD, much of Britain was occupied by Celtic Britons; and above them in Scotland, the Picts. When the Romans invaded in 43 AD, they pushed the Britons west but had little success against the northern folk they called “Picti”, or “painted people”. Thwarted, they instead built Hadrian’s Wall to keep the Picts out (post of Feb 1o, “Hadrian’s Wall“). In the AD 5oo’s, Angles from northern Europe invaded and pushed the Britons further west (eg, Wales), but the Angles also had no luck against the Picts. It would take centuries of warfare before the Picts and the descendants of the Britons and Angles would form a more or less united kingdom. Not much remains of the Picts. Their language survives only in the names of places, but evidence of a developed culture can be seen in their art, which consists of symbols (of unknown meaning) engraved on metalwork or carved on stone (shown on the left). The purpose and meaning of the carved stones are poorly understood. 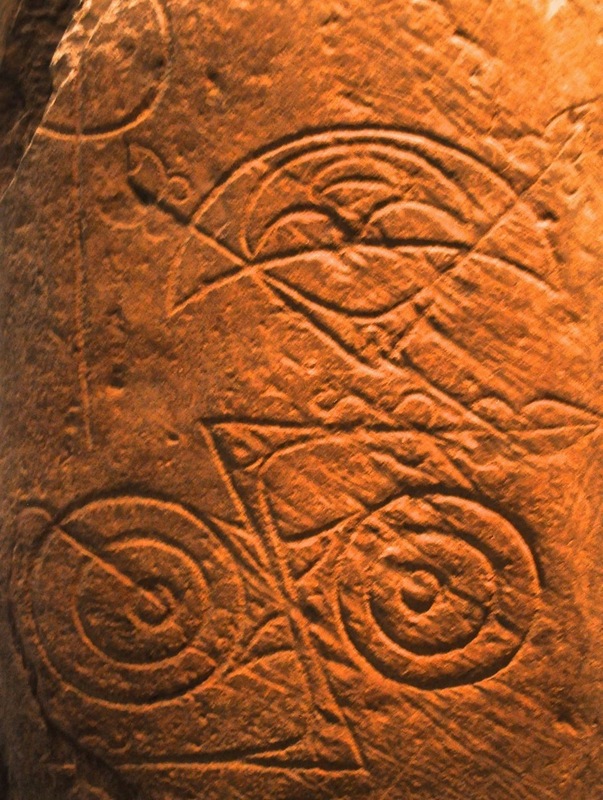 Earlier stones may have served as personal memorials or territorial markers; after Christianity spread to the Picts, the stones fell more easily into categories like gravestones. In the AD 800’s, stone markers were commonplace in Scotland (examples shown below). 1100’s (it had been captured by Vikings in the 800’s). When found, the hoard contained 78 chess pieces; 10 are here, the rest are owned by the British Museum. Aren’t the pieces gorgeous??! I love them! Scotland” to Pope John XXII, 132o, “in the name of the whole community of the Realm”, declaring their determination to maintain Scottish independence and support King Robert Bruce. It reads “As long as only one hundred of us remain alive we will never on any conditions be brought under English rule.” This sentence is written in big letters on a wall of the museum! No hand-written letter under a glass case here! There is definitely an undercurrent of Scottish nationalism that we encounter in many small ways. The last picture shows a two-handed sword from the early 1500’s called a claymore (from the Gaelic for “great sword”); its distinctive hilt was used only by the Highlanders. I’ll close our museum trip with 3 more pictures. The first is a painted ceiling from Rossend Castle, done in 1617 in honor of a visit by King James VI (post August 4, 2015, “Stirling Castle“). The clothes are a doublet and trunk hose, in silk and silver, from 1660. The last is actually relatively modern – 1904 – a harp case with Celtic designs carved in Art Nouveau style. I should also mention the museum had the stuffed body of Dolly the sheep, the first successful clone of a mammal from an adult cell. But y’know what? It looked like a sheep. fascinating, really old cemetery at the base of Calton Hill – so off we go to visit. One of the finds is the resting place of David Hume, an extremely influential Scottish philosopher (eg, his “A Treatise of Human Nature”, 1739, written at age 23, is regarded as one of the most important works in the history of Western Philosophy). Actually born David Home, he got tired of the English screwing up the Scottish pronunciation of his name and so had it changed. Also visible is the Palace of Holyroodhouse, parts of it dating from the 1300’s. Scottish royalty preferred it over the blustery castle on the hill. The last picture shows a view of Calton Hill from below. on the left shows how hilly this city is. From Edinburgh castle on the top of the hill, the (obscured) Royal Mile in Old Town moves off the picture to the left. New Town starts with Princess Street, angling down to the lower right corner. Between them is a valley, now the Princess Street Gardens. Previously this valley was a lake – the town’s water reservoir, sewer, and place to drown witches (~17,000 in 250 years; if you survived the tied-to-a-chair dunking, you were clearly a witch and were burned at the stake). The clock tower in the picture on the right (above) is a historical building, now a (very) expensive hotel. The triangular building behind it is the impressive Sir Walter Scott Monument. And behind that, perhaps you can see the very large Ferris wheel, part of the holiday celebrations at the Princess Street Gardens. Now let me show you hilly! Doesn’t Princess Street look like “street level”? It certainly seems to be when you’re on it, but remember earlier in talking about Edinburgh I said “… rich and poor living on top of each other …”? That was literal! There’s another whole city below your feet, as shown by the picture to the left. 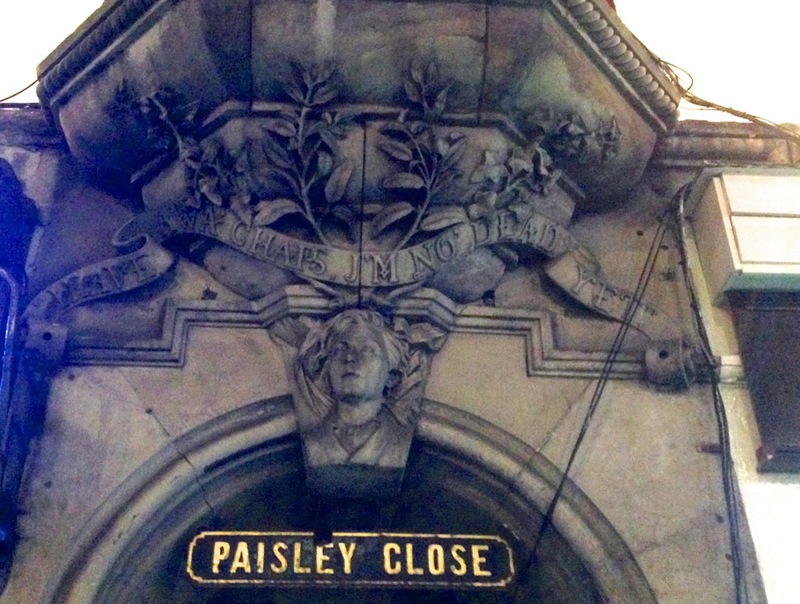 It’s taken near our apartment – that’s Princess Street up above, with the columns! The poor lived in underground warrens – often without windows – accessible down (literally down) alleys (where chamber pots were emptied). where royal proclamations were read since the 1300’s (and many an execution was held). This structure is actually from the later 1800’s, but is close to the original site. The Scots do love their traditions – in 1952 a town crier proclaimed from here that Britain had a new queen, 3 days after the event took place – (traditionally it took 3 days for a horse to gallop here from London). The other two pictures are of a neighborhood wellhead, no longer used. Before buildings had plumbing, citizens got their water from these wells, piped from a reservoir near the castle. Our last historical picture is an embellishment over a “close” (tiny alley between buildings). Here, just off the Royal Mile, in one of the worst slums in 1861, several 250-year-old houses collapsed, killing 35. As the debris was being cleared away, came a shout from a young lad underneath: “Heave awa’ chaps, I’m no’ dead yet”. I haven’t mentioned Scottish cuisine yet. It is very good! Scotland is everywhere close to the sea, and we took advantage of that, as shown below. 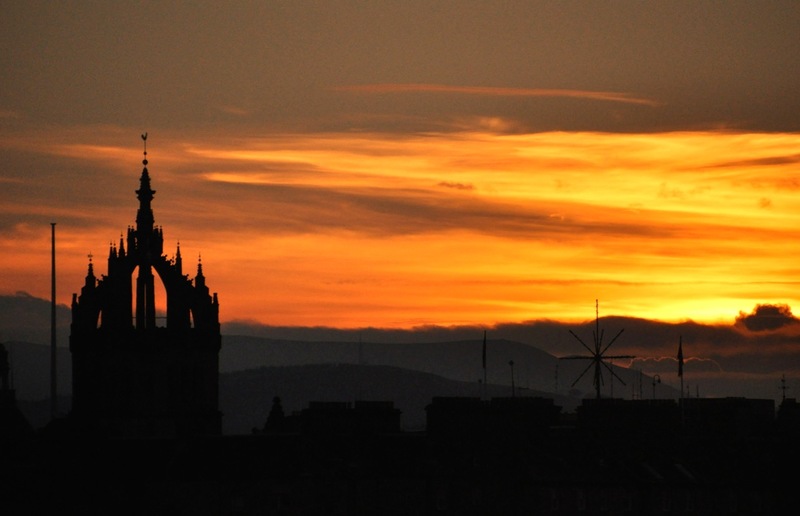 To finish, this last picture shows the top of the beautiful St. Giles’ Cathedral off in the distance, kissed farewell by a beautiful sunset. Next post: Edinburgh’s Castle, St. Giles Cathedral, and the Hogmanay, Scotland’s world-famous New Year’s festival. 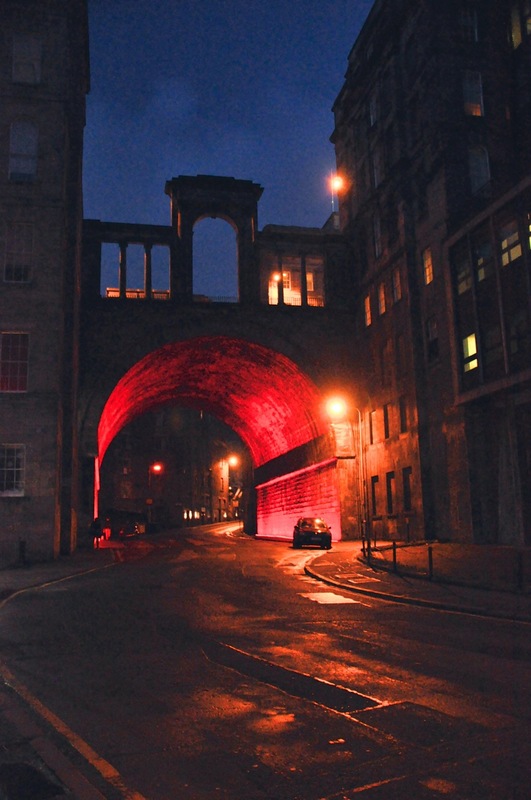 This entry was posted in Edinburgh, Lowlands, Scotland. Such a beautiful place. Loved the architecture and the photographs. I thought the chessmen were pretty cool too!